Habit: Annual [perennial herb], 10--90+ cm, generally canescent. Stem: erect, branches wand-like to widely divergent. Leaf: proximally opposite, 2--10+ pairs in Feb--Apr, otherwise alternate, petioled, blades proximally lance-linear to lanceolate, distally elliptic or lanceolate to +- deltate or ovate, entire or toothed, minutely strigose to silky-hairy, sometimes coarse-erect-hairy, generally gland-dotted, 3-veined. 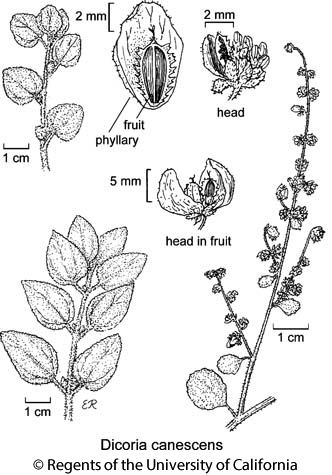 Inflorescence: heads disciform or discoid and staminate, 1 or loosely in 2s or 3s in generally bractless, raceme- to panicle-like clusters; involucre 3--5 mm diam, +- cup- to saucer-shaped; outer phyllaries (4)5(7) in 1 series, free, +- green, inner 0--4, each subtending a pistillate flower, scarious to membranous, enlarging with age, ovate to elliptic in fruit; receptacle convex, generally paleate, paleae wedge-shaped to linear, membranous, +- soft-hairy to bristly distally. Staminate Flower: 5--15+; corolla +- white to maroon, funnel-shaped, lobes 5, erect, reflexed, or curved inward; filaments fused, anthers free or generally fused at tips. Pistillate Flower: (0)1--4; corolla 0. Fruit: strongly compressed front-to-back, +- obovoid to ellipsoid, smooth or warty, sometimes gland-dotted, margins corky-winged, toothed, fruit tip often white-tufted; pappus 0. Leaf: petiole 5--20+ mm; blade generally 1--3(12) cm, 3--20(30) mm wide. Inflorescence: peduncle 1--3+ mm; involucre 2--3+ mm at flower; outer phyllaries +- lanceolate to ovate, minutely strigose to +- silky-hairy, inner becoming obovate to +- round, generally +- hood-shaped, generally glandular-hairy, each +- surrounding a fruit; paleae 1.8--2+ mm. Staminate Flower: corolla 2.5--3 mm. Fruit: 3--8+ mm. Chromosomes: 2n=36. Ecology: Alkaline or sandy soils, dunes, washes, flats; Elevation: < 1300 m. Bioregional Distribution: SCo (Colton Dunes, San Bernardino Co.), SNE (exc W&I), D; Distribution Outside California: to Colorado, New Mexico, northwestern Mexico. Flowering Time: Sep--Jan Note: Highly variable; features vary +- independently. Citation for this treatment: Bruce G. Baldwin, adapted from Strother (2006) 2012, Dicoria canescens, in Jepson Flora Project (eds.) Jepson eFlora, http://ucjeps.berkeley.edu/eflora/eflora_display.php?tid=2448, accessed on April 24, 2019. SCo (Colton Dunes, San Bernardino Co.), SNE (exc W&I), D; Markers link to CCH specimen records. Yellow markers indicate records that may provide evidence for eFlora range revision or may have georeferencing or identification issues. Purple markers indicate specimens collected from a garden, greenhouse, or other non-wild location.